Our overmoulding services are based on Henkel Corporation’s brand of thermoplastic hotmelt adhesives called Macromelt – or more recently called Technomelt. 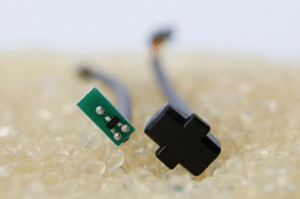 This material consistently provides excellent results, as our electronics team create high quality, durable overmoulding projects using Henkel Corporation technology. While there are a number of alternatives, we have chosen to work closely with the compounds from Henkel Corporation because this method provides a cost effective, reliable product that offers superior sealing while consistently creating projects to a high quality with a positive effect on the environment. Macromelt thermoplastic hotmelt adhesives are based on natural fatty acids. They show good adhesion to plastics like PA6.6, ABS and PVC, and have low temperature flexibility with a wide service temperature range. Offering superior overmoulding properties, each grade of material is also available in both amber and black. Some bespoke colours are available, please contact us to discuss your requirements. Moisture and solvent resistance requirements will be key factors in selecting a specific grade of material – the softer materials generally offer the best adhesive properties. It is also important to be aware that most Macromelt moulding materials do not have good resistance to solvents in combination with mechanical stress. But you don’t need to worry, we’ll be there for you offering our manufacturing guidance and expertise to support you across the entirety of the project. Leave the details to us.